The National Library of China (NLC) has an enviable collection of some 270,000 rare records and 1,640,000 ancient records. Among these, the oracle bones, the Zhaocheng Tripitaka (Zhaocheng Jinzang), the Yongle Encyclopedia (Yongle Dadian), the Complete Library of the Four Branches of Literature (Siku Quanshu) and the Dunhuang Materials, are probably the most valuable. 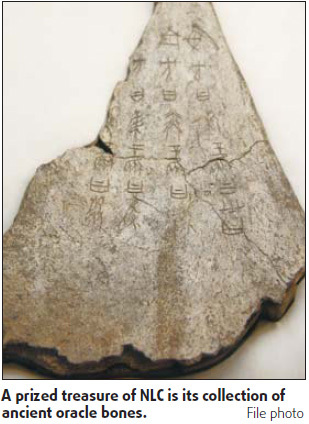 The oracle bone inscriptions were first discovered in Anyang, Henan province, at the end of the Qing Dynasty (1644-1911). They cover politics, the military, agriculture, astronomy, hunting and construction, offering precious insight into the slavery system in China in the late Shang Dynasty (c.16th-11th century BC). The NLC collection has 35,651 pieces of oracle bones, accounting for a quarter of the total find. The majority came from the private collection of Liu Tizhi, in 1953. All 28,450 pieces of oracle bones from Liu's collection are now placed in 150 rosewood boxes with walnut covers, preserved in the library's highly guarded underground treasure house, with constantly monitored temperature and humidity. The Zhaocheng Tripitaka was compiled in the 12th century and discovered in 1933 in Guangsheng Temple, Hongtong county, Shanxi province. During the War of Resistance Against Japanese Aggression (1937-45), Li Kong, abbot of the temple, sought help from Communist guerillas, who carried the precious cultural relics while fighting Japanese troops in the mountains. Before the founding of New China, more than 4,000 volumes out of the nearly 7,000 volumes were preserved and passed on to the library. The restoration work lasted 17 years. The Yongle Encyclopedia is so named as its compiling was ordered by Emperor Chengzu of the Ming Dynasty in 1403. It is the most comprehensive encyclopedia of ancient China, and includes 8,000 books from the Qin to Ming dynasties (221 BC-1644), covering a wide range of subjects. But the encyclopedia seems ill-fated. The original work was lost with the fall of the Ming Dynasty (1368-1644); the duplicate made in the Qing Dynasty was largely damaged by fire when the Eight Western Allies invaded Beijing in 1900. Some 400 volumes remain preserved in eight countries, with half of them, 221 volumes, in the NLC. In 1983, one precious volume was found in rural Yexian county, Shandong province. The old woman in whose hands it was found, had cut out margins of the paper to make shoe samples and cigarettes. Luckily, out of respect for knowledge, the illiterate farmer kept the parts with words. NLC is reproducing the encyclopedia, keeping to the original layout and binding method. An exhibition on its treasured collections is being held in the NLC and can be seen till Oct 7.